Frustrated With Your Lack Of Progress? Our Customer reviews sell our driving lessons in Derby along with our driving lesson videos found on our YouTube channel. We do not attempt to compete with the cheap driving lessons in Derby and this reflects the level of dedication and commitment of our driving instructors in that they’re able to deliver some the best driving lessons in the local area. We compete on quality and value. Our customers benefit from quicker learning and saving money by typically needing fewer hours overall. See our “Why I Changed Driving Schools” review page and hear what others have to say about “buying cheap” first time around. We’d be delighted to listen to your needs, answer your questions and check driving lesson availability in your area. "I've had SIX driving instructors!" 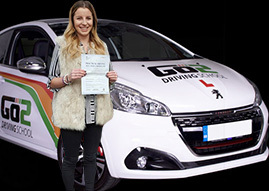 "I Had An Amazing Experience With Go2"
"Best learner driving tuition arguably in the East Midlands"
We are proudly featured on www.DrivingSchoolsFinder.co.ukwww.DrivingSchoolsFinder.co.uk, Check for our ratings and past learner reviews.